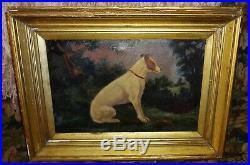 Antique Folk Art Primitive Dog Terrier & Mouse Oil On Canvas Painting. 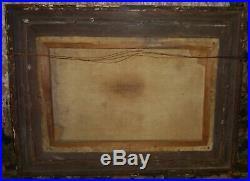 19th century oil on stretched 12″ x 18″ canvas. Unsigned as far as I can tell. Looks to have some words stamped on back of canvas. Cannot make out though. Depicts a dog next to a dead mouse or rat. Some kind of Terrier, it appears. 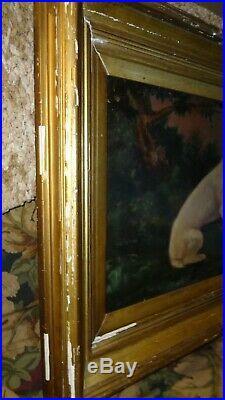 Frame is in poor condition with lots of chips and wear so would look much better if you get it reframed. Frame is 18 1/4″ x 24 3/8″. See photos for details and condition. The item “Antique Folk Art Primitive Dog Terrier & Mouse Oil On Canvas Painting” is in sale since Saturday, March 2, 2019. This item is in the category “Art\Paintings”. The seller is “kimmly” and is located in Garland, Texas. This item can be shipped to United States. This entry was posted in antique and tagged antique, canvas, folk, mouse, painting, primitive, terrier. Bookmark the permalink.